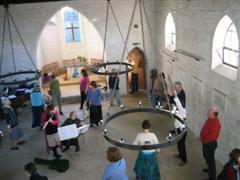 On a Summer School at a community called Othona in Dorset, Alison discovered the pleasures of Circle Dancing. In 1999 she took time away from her work as a professional musician to take a specialized teacher training course run by Judy King. 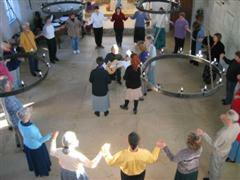 This increased her passion for dancing and she has since led many circle dance sessions with both children and adults. She enjoys leading the dances to live music and has found teaching the dances to musicians before they play the pieces is a good way for them to really feel the rhythm. 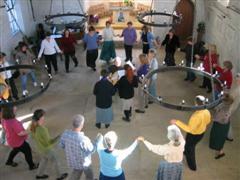 Circle Dancing is closely connected to the traditional music and culture of many countries, and often takes place as part of a celebration. It’s a great way to exercise as well !